I think spring has really arrived. My tulips and daffodils are up and it makes me think of Easter Baskets, May Day Baskets and of course Quilt Baskets. 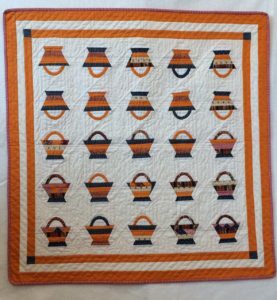 I thought I would share a few little basket block quilts today. This first one is made with little 2” Basket blocks called “Baby Bunting”. I guess I still can’t get away from my favorite pink and brown fabrics. This next one I purchased on e-bay. According to Barbara Brackman it is just called “Basket” block. 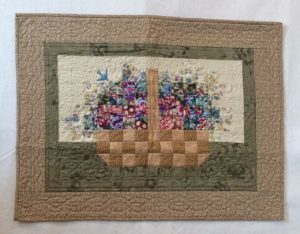 I love the way the quilter added a floral fabric for the center triangle to add interest to her baskets. Not only does it have adorable baskets but it is hand quilted. Of course, that makes it even more special to me since I don’t do a lot of hand quilting, but I love it when other people do. This third quilt is a throwback almost 20 years ago to my “watercolor” quilt days. 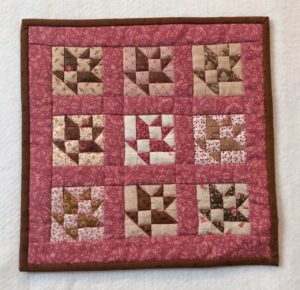 I used to love to cut up little florals into 2” squares and put them together to create a design. This basket is just a little deviation from that, using a checkerboard made of beige and tan for the basket with various florals for the filling and a fussy cut little bird in the upper left side. I still like it even if it has been in my quilt collection almost long enough to approach vintage status. 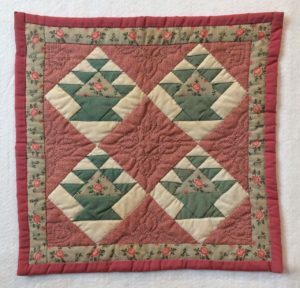 This last quilt is my favorite basket quilt in my collection. I completed it in 2016 for an AQSG challenge to make a reproduction of a basket quilt from the 1800s in miniature. The original full size quilt belongs to my friend Lorie Stubbs and is made with beautiful cheddar and indigo fabrics. I made this reproduction (34.5” x 35”) and it is less than one fourth the size of the original. I also hand quilted it! It took me over three months to quilt but it sure was fun and I love the result. It will be published in a book later this year. I would encourage you to pull out some favorite fabrics from your stash this month and make a basket quilt of your own to celebrate spring. ← G is for it’s GOTTA GO! Yarn and Fabric, that is!